Dariel Johnson in a file photo from her PCC debut in 2014. Johnson has returned to the Lancers as the team’s starting center in the 2018-19 season. 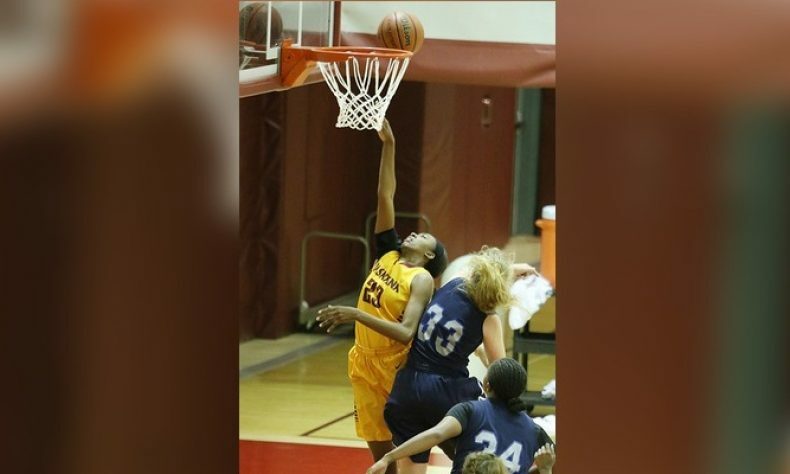 Pasadena City College women’s basketball head coach Joe Peron wanted to avoid the depth issues his team had last season, so it was a heavy recruiting off-season for the Lancers and Peron’s assistant coaching staff. Successful opening results in the form of two wins at the Bakersfield College Crossover Tournament have PCC excited about its prospects for the 2018-19 season. Peron, in his 23rd season directing the program, picked up his milestone 500th career victory late last season. He is 2-0 thus far in the new season behind two 20-point plus victories at Bakersfield. The Lancers downed Riverside City College, 79-57, on Friday in the season opener and followed that with a 72-43 rout over the host Renegades on Saturday. The team returns just three players from last season, and none are part of the starting lineup. The Lancers reconfigured lineup includes two Pasadena High alums in 5-foot-11 forward Mariah Cathcart and a redshirt from the 2014-15 season in 6-1 center Dariel Johnson. Cathcart was a Pasadena Star-News All-Area First Team selection and All-CIF Division 4AA while playing for the Bulldogs. Johnson has battled back from injury issues to become the team’s primary post player to replace graduated 1,000-point scorer and All-State selection Alisa Shinn. Another local is 5-5 freshman shooting guard Kailey Thai, an All-San Gabriel Valley Tribune First Team choice out of Arroyo High. Transfer sophomore guard Daniela Mendez played on a 27-4 College of the Sequoias team that made it to the State Championship Tournament in 2016-17. Mendez adds to the team’s scoring potential. The final piece to the starting lineup is frosh point guard Cosette Balmy, who was All-State at Ribet Academy after being All-CIF Division 5A Player of the Year at Bellarmine-Jefferson as a junior. Cathcart scored 21 points, making 9 of 10 shots from the floor, and Johnson added 12 points, 15 rebounds, seven blocked shots, five assists and four steals in the team’s triumph over Riverside. Balmy added 14 points, eight assists, five rebounds and four steals while Thai scored 14 points, making a trio of 3-pointers. Against Bakersfield, Balmy scored a game-high 26 points with five assists while Johnson again was an all-around force on 11 points, 15 rebounds, seven assists, five steals and five blocks. Mendez added 10 points. The Lancers bench is stocked with experienced players including All-South Coast Conference North Division Second Team guards in ’17-18 starters–Jade Lin and Elise Ortega. Forward Tatiana Shoals also returns from last season. The rest of the freshmen incoming class are 6-2 center Teana Debose (Price Christian), 6-1 forward Alicia Spicer (Duarte HS), 5-10 center Alexandria Arreola (Garfield), 5-8 forward Zaira Velasquez (Garfield), and guards Myiah Ford (from Kansas), Melissa Felix (St. Paul), and Mya Rivera (Alhambra). Arreola and Felix each scored six points in the Bakersfield win. Peron added another former player to his assistant coaching staff in Judith Espinoza, the school’s eighth all-time leading scorer and one of the more prolific passing guards in her time at PCC (2014-16). He brings back Shay Jackson and long-time assistant Gary Potts. Fans can get a first look at the Lancers this Thursday-Saturday, Nov. 8-10 as they host the 6-team, PCC Round Robin Classic. College of the Sequoias, College of the Desert, Imperial Valley, Citrus, and San Diego City participate with three games each day at Hutto-Patterson Gymnasium. PCC opens with a 6 p.m. game on Thursday v. Imperial Valley. On Friday, the Lancers play an anticipated matchup with Sequoias at 7 p.m. They finish with a 2 p.m. game on Saturday v. San Diego City.